Mr Peter Drew OBE Founding Master 1985-1987, and also from 1992-1993. Mr Peter Robert Lionel Drew was born on 4 September 1927 and was married to Wendy. He passed away on 3 June 2007. His occupation on retirement was Chairman of Taylor Woodrow plc (1989-1992) after a long, varied and successful career. In 1979 he was honoured with an OBE. Peter trained as an Architect and Civil Engineer working as a young research assistant on the development of Autogiros during the Second World War. He was Founder and Chairman of St Katharine by the Tower Limited from 1970-1992 during which time he started the preparations for the development of Canary Wharf on behalf of the Government. Peter’s involvement was critical as he established the working committees that ensured that the development went ahead. He remained an advisor during the early years of the project. He was also the founder of the World Trade Centre London in 1973. His experience was valued around the world. He became Advisor to the the Port of NJ in New York during the construction of the Twin Towers in 1973 and he was Chairman and Vice President of the International World Trade Centres Association from 1974-1989. He was Honorary Director of The World Trade Centres Association, New York from 1992-2007. Active in the City, Peter was both the Founding Master (1985-1987) and Master from 1992-1993 of the World Traders and our Company owes him a tremendous debt of gratitude. He was clothed as a Liveryman on 16 March 2000, having received the Freedom of the Company on 21 September 1993, and the Freedom of the City of London on 14 May 1971. 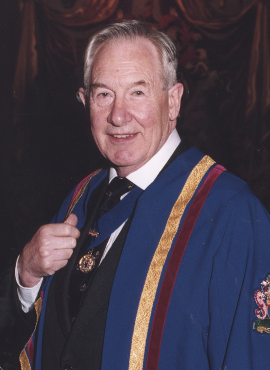 In addition to his World Traders interests, he was Warden of All Hallows’ by the Tower (1972-1994), a Freeman of the Company of Watermen and Lightermen (1975-2007), Master of The Tower Ward Club (1986-1987) and Liveryman of The Worshipful Company of Painter Stainers (1984-2007). Peter applied his professional experience to his love of the City as a Trustee of the Queen’s Jubilee Walkway Trust (1977-2007) and Governor of The Museum of London/Docklands (1992-2000). His other roles included: President of the London World Trade Centre Association (1985-1989), Fellow of the Institute of Directors (1985), Fellow of the Royal Society of Arts (1989), Companion of the British Institute of Management (1990) and Governor of Sadler’s Wells (1990-1995). He was deeply involved in developments in the City and East End such as Wilton’s, the Royal Opera House and other projects such as Chatham Dockyard, saving historic ships, such as Thames Sailing Barges, the Dunkirk Little Ship, The Challenge and many more too numerous to mention. 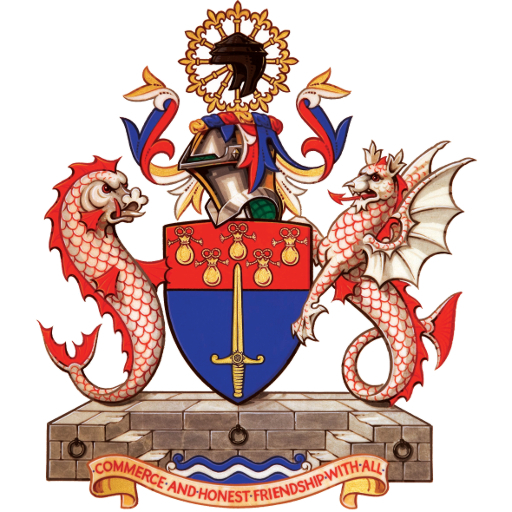 The World Traders crest reflects Peter’s perspective on the City of London and his experiences of City life. In addition to his work in establishing the Company, the World Traders crest is Peter’s wonderful and enduring legacy.